The Elf Owl is a tiny, short-tailed owl with a round head and no ear-tufts. It was originally known as Whitney's Owl. The species name whitneyi is a Latinised word formed from the last name of Josiah Dwight Whitney (1819-1896), a prominent American geologist. Description: General colouration varies between more greyish and more brown. The facial disc is brownish, diffusely vermiculated, and with narrow whitish eyebrows. Eyes are pale to bright yellow. Cere is pale greyish-brown and the bill pale greyish-horn with a yellowish-horn tip. Upperparts are greyish-brown, densely vermiculated lighter and darker. The forehead has some ochre spots, and the nape has a narrow whitish nuchal collar. Wing-coverts have whitish spots, and the outer webs of the scapulars are whitish, forming a prominent white row across the shoulder. Flight feathers are barred whitish and ochre-buff. The tail has 3-4 narrow pale bars, and only ten rectrices. Underparts are whitish, densely mottled and vermiculated greyish-brown and cinnamon. Tarsi and toes are pale greyish-brown and bristled. Claws are dark horn. Size: Length 13-14cm. Wing length 99-115mm. Tail length 45-53mm. Weight males 36-44g, females 41-48g. Habits: A nocturnal bird. They sit fairly erect and have a knock-kneed stance. Flight is somewhat bat-like, but not as erratic. 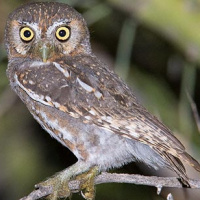 When danger approaches, an Elf Owl straightens its body, covers its lighter underparts with one wing, then turns its head and peers over the bent wing with the top of its eyes. They are not very aggressive, preferring to fly away rather than fight. Voice: Elf Owls have many distinct vocalisations. The primary advertising call of the male is a high-pitched yip - "whi-whi-whi-whi-whi". Five to 20 notes are given during each sequence and calling can be almost continuous through the night. Calling is most intense during early evening and near dawn, on moonlit spring nights. A shorter version of this song attracts females to potential nest sites. Mated pairs may also duet, but the female's song is softer and shorter. The female emits a short "peeu" note to help the male locate her. The male can give a short flight song "CHU-ur-ur-ur", when he leaves a cavity that he has been "showing" to his mate. When disturbed both sexes give a sharp "cheeur", which is often repeated. Nestlings give a repetitive rasping call when hungry. 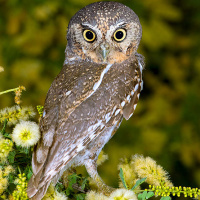 Hunting & Food: Elf Owls hunt small, weak prey because of their relatively weak feet and talons. Virtually all prey are arthropods - mainly insects and scorpions, although they likely take the odd mouse or small bird also. There have been a few rare records of small lizards and small snakes being taken. Other common foods include grasshoppers, locusts, mantids, fly larvae, caterpillars, centipedes, and cicadas. 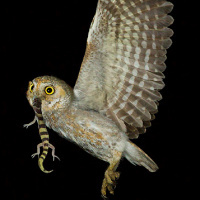 Most prey is captured in flight as Elf Owls are very maneuverable in flight. They hunt mainly by flying out from perches on trees, shrubs, or cacti to hawk flying insects or by flying over open ground. They often hover over insect prey, causing the insects to take flight, then capture them in mid air. They also pluck insects from tree branches or the ground without taking off, and forage by walking on the ground. Elf Owls are occasionally attracted to campfires or other bright lights in their quest for flying insects. Prey are carried to a nearby perch, where they are torn apart before being eaten. Pellets are tiny, dry and loosely formed. They contain mainly insect body parts and tend to disintegrate soon after ejection. Breeding: Around April, Males attract females to potential nest sites by calling from a cavity, then flying out while singing, as she approaches. On moonlit nights calling occurs continuously all night. 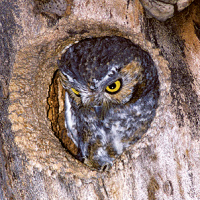 The female selects the nest cavity and begins to roost in it prior to laying eggs to prevent occupation by other hole-nesting birds. 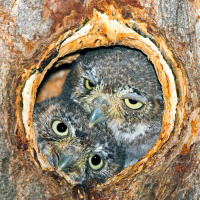 Elf Owls are entirely dependent on woodpecker cavities for nest sites, both in cacti and deciduous trees, so there is some competition with nesting woodpeckers over cavities. Northern Flickers and Gila Woodpeckers in saguaro cacti, and Acorn Woodpeckers in woodlands, provide most of the cavities used for nesting. Cavity entrances range from 3 to 10 metres (10 to 33 feet) above ground. In April or May, 1 to 5 white eggs (average 3) are laid at intervals of 1 to 3 days. Incubation commences after the second egg is laid and lasts at least 2 weeks (up to 24 days according to some sources). Unlike other owls, the female sometimes hunts at dusk during incubation, leaving her mate to incubate the eggs in her absence. Nestlings are fed by the female as she passes on food brought to her by the male. During peak hunting periods, the male may bring food to the nest as often as once per minute. Young fledge after 28 to 33 days. 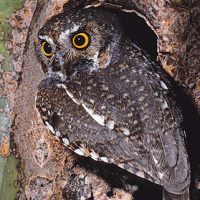 Elf Owls are single-brooded, and their breeding success is the highest of any reported for North American Owls (70% of all eggs laid result in fledged young). This high rate of success is due to the difficulty that mammalian predators have in reaching nests, especially those in cacti. Territories during the breeding season are very small compared to other small owls. 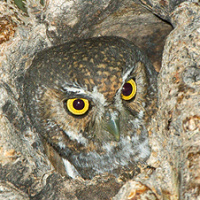 Nesting owls confine themselves to an area between only 20-70m from the nest. Breeding densities are very high for owls, as many as 4.6 pairs per square km. Mortality: Captive Elf Owls have lived for more than 5 years. They have few enemies because there are few larger Owls that occur in the same habitat. Mammalian predators have difficulty in reaching nests, especially those in cacti. 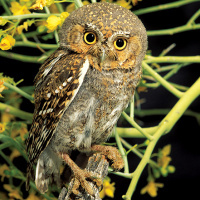 Habitat: The Elf Owl inhabits arid deserts overgrown with saguaro cacti, thorn scrub, and mesquite or deciduous riparian woodlands and adjacent tablelands from 600-2200m elevation. They are most abundant in deserts dominated by giant saguaro but are also found in most woody habitats within their range (except for pure stands of pine). They are found in ravines, canyons, plateaus, and on mountain slopes. 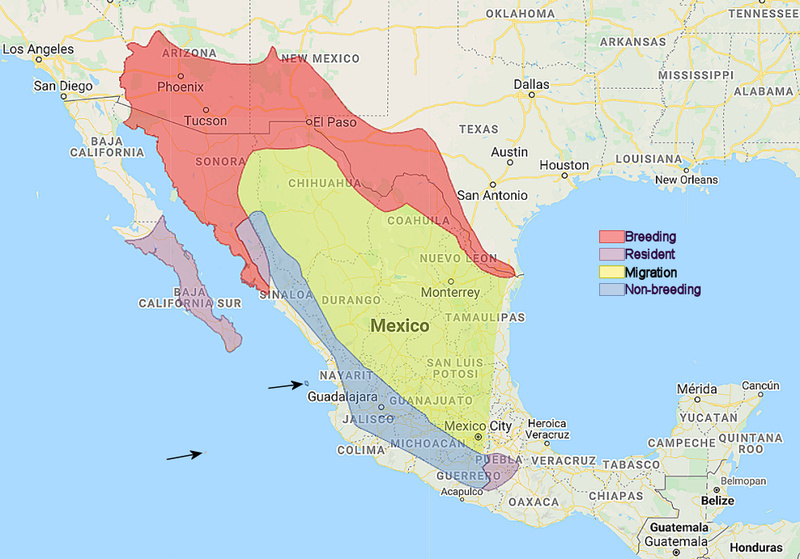 Distribution: From Southwest USA to Central Mexico, Baja California and Socorro Island. Northern populations winter in Central Mexico and on the Pacific slope north to Sinaloa. Original Description: Cooper, James Graham. 1861. Proceedings of the California Academy of Sciences (Proc. Cal. Acad. Sci. ; Series 1) 2: p. 118. 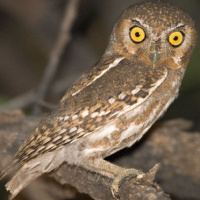 See also: Other owls from North America, Genus: Micrathene.